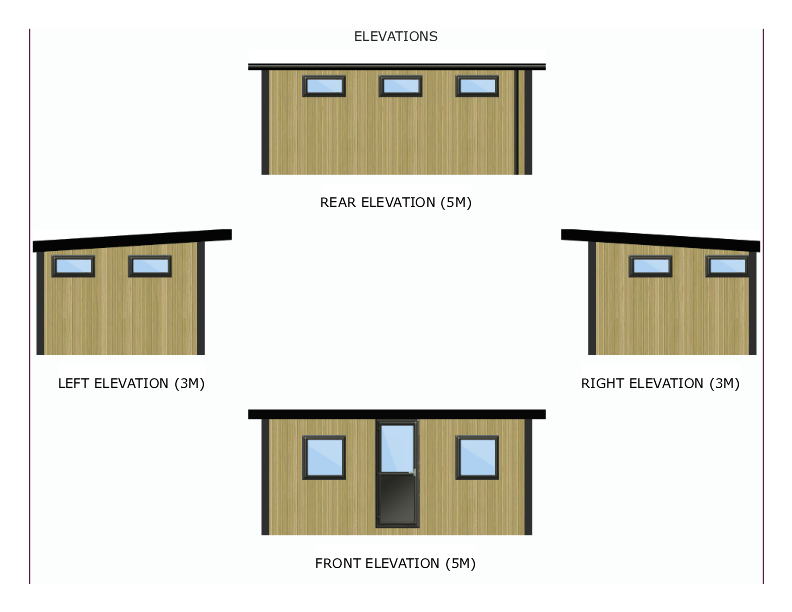 Looks like you'll get plenty of natural light and the size is to be envied. Not getting it but I'm on me tablet thingy at moment. Will have a look on my real computer tomorrow! Vision over visibility. Bono, U2. I tried it on my freebie tablet and it offered to open it in Office Suite - looked OK. It may depend on what apps you have installed. I've managed to import the PDF into Paintshop Pro and export it as a PNG so this is what it should look like. A very nicely sized building. Nice shed in sight ! Don't forget the bar. All the time the project has been in the planning stage, waiting for the space to be available, I have been planning the operating timetable. The planning has been quite complex, but I’ll try to introduce it a little at a time. First, there will be thirteen trains arranged in fixed rakes (initially at least). Each train takes its number from the proposed loco DCC ID. The numbering may seem quite random but it represents the order that each first appears in the timetable. Number 12 was added at a later date and so is out of order (and was swapped with Number 2) and the branch train was numbered 19 to avoid confusion with the main line trains. The numbering is summarised below. 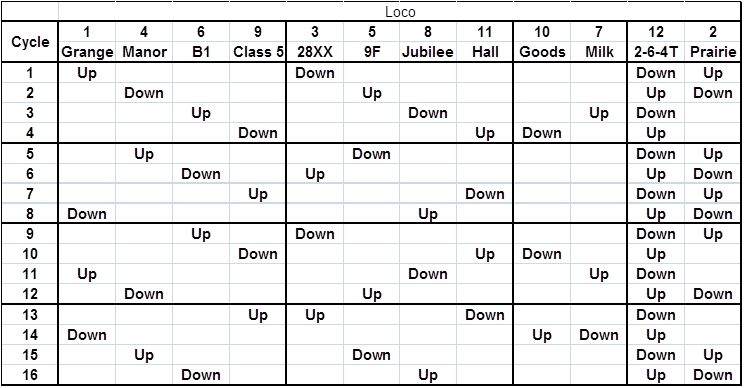 Constructing the timetable was a lengthy process, but I will leave the details until later. Suffice it to say, the timetable is divided into four cycles and each cycle into four sub-cycles. Each sub-cycle consists of two parts, with the branch train running up in the first part and down in the second. After all four cycles, all the trains will be returned to their starting position. This is expected to take about three and a quarter hours. Part 1 of sub-cycle 1 is shown below. Just to confuse the issue, I have shown the speed on the timetable as the scale speed in mph. 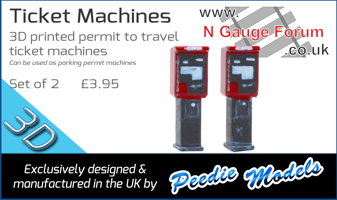 1 mph scale speed equates to 0.3 cm/sec. In the final version I hope to indicate the speed in the timetable as DCC calibration settings (0 – 28). I haven’t actually used DCC yet, but I presume that each train will be calibrated so that a DCC setting of 28 equates to its maximum speed as set out in the list of trains above. Very impressive planning, Lawrence. I have a WTT for weekdays and Summer Saturdays which can also vary by year. However, it won't really be used until I have a bigger layout with Penmayne (the terminus) and Wadebridge and / or a fiddle yard to run trains between. I wanted every train to be returned to its original starting position after the completion of timetable operations. I had already decided that I would like every train to run once in each time timetable cycle, although later I allowed the local goods and milk train to remain in their depots for a complete cycle to allow for loading and unloading. Because there were four intermediate passenger trains, I wanted there to be one per sub-cycle for each timetable cycle. To allow them to run in a different order for each cycle, there would need to be four cycles in total. There were some other conditions that I wanted the timetable to fulfil. Firstly, for each sub-cycle, there should be two parts. During the first part, the branch train would run in the up direction, the 2-6-4T would run on the main in the down direction during the first sub-section, then in the up direction during the second, etc. During the second part the branch train would run in the down direction and there were two alternatives on the main line. In one case prairie would run in the opposite direction to the 2-6-4T and a long-distance freight would run the other way. In the other, a local freight (goods or milk) would run in the opposite direction to the 2-6-4T and express passenger would run the other way. To see how this would work I constructed the following manifest. Notice that I have numbered the sub-cycles continuously from 1 to 16. Sub-cycles 13 and 14 are slightly different, to allow for the local freight trains to return to their original starting position and 16 has an express passenger replacing the heavy freight used in 13. After the manifest I needed to check whether this could all be achieved using eight storage loops at each end of the layout. The following feasibility matrix was used. The numbers across the top represent the sub-cycles and the numbers in the table indicate the train in a particular loop at the end of a sub-cycle. So Sub-cycle 0 represents the starting position. It was essential that, at the end of Sub-cycle 16, the same trains were in each loop as at the start. In turn, this allowed me to propose the following routes from up to down and vice versa (including routes commencing or terminating at local depots). 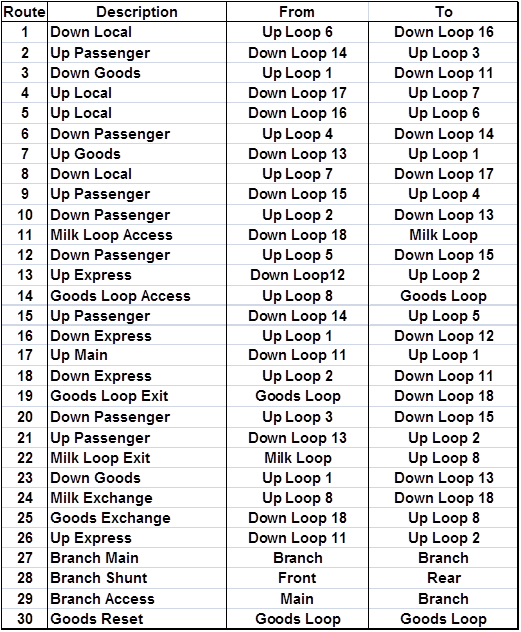 After milk depot operations, it is necessary to invoke the Branch Main route (27) to ensure that the up main line is set to normal up operations. The Goods Reset route (30) serves the same purpose on the down main line. I will show the routes and associated points in a later posting. 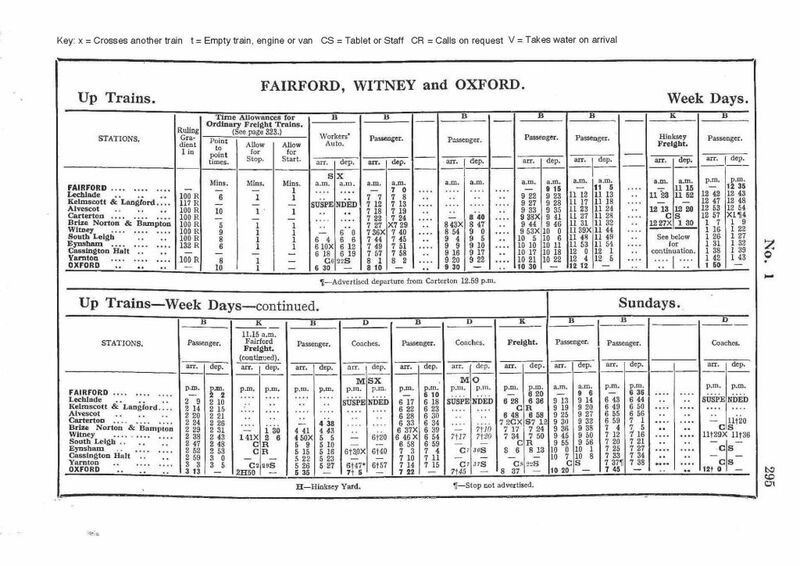 Train graphs were (and probably still are) an essential planning tool for a real railway. Back in BR days they were all made with lines on paper, although these days they are probably computer generated. Essentially a train graph consists of lines representing the progress of all the trains. The sloping lines are all straight lines with the slope determined by the average speed of the train and there are horizontal lines showing stationary trains. Along the edge is a representation of the route indicating all the stations, junctions, passing loops etc. Trains are shown travelling in both directions so the crossings at junctions and crossovers can be planned safely. An example of a train graph is shown below. On a model railway a train graph would be of little help because generally there is only one station, only one junction and only one or two trains on the main line at any one time. 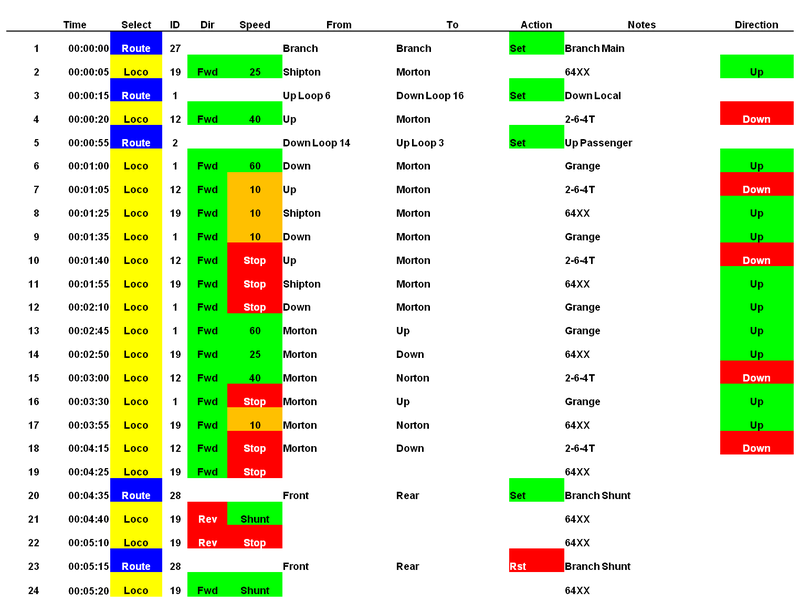 However, a simplified strip chart showing the speed of the trains and the switching of points or selection of routes can be of great help in planning an operational timetable. Before the strip chart can be constructed it is necessary to work out how long each part of a journey will take for each train. I have used a matrix to do this as shown here. The matrix is specific to DCC control and would need to be modified for simple DC control. The Slack time is the time after the initial start that deceleration needs to begin and Slack 2 is the further time elapse before the final stop. An example of a strip chart is shown below. This is for Sub-cycle 1 (from my previous post). The sub-cycle has two parts. The first part is shown as “1” and the second part as “1a”. The strip chart allows the timings of the trains to be adjusted so the operator does not have to carry out more than one operation at a time, even though there may be several train movements going on at the same time. 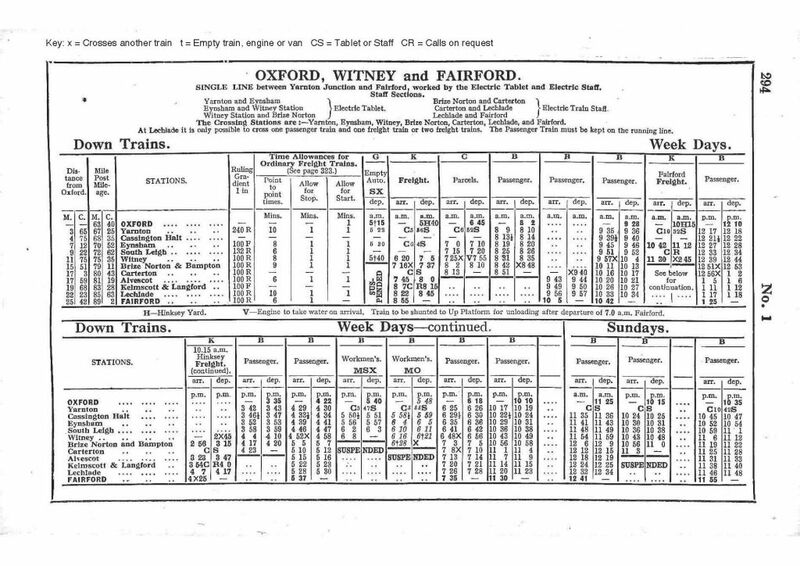 The full operational timetable, part of which was shown in an earlier post, can be produced from the strip charts. 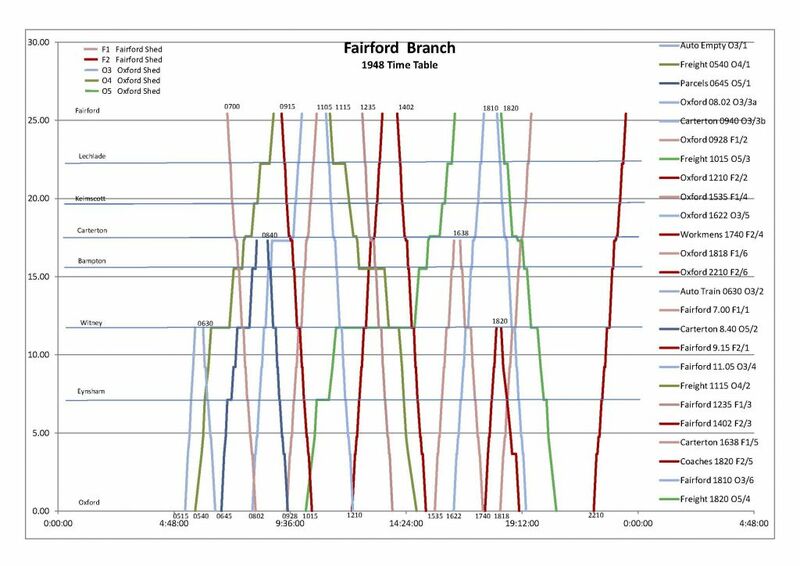 Without realising it was done it real practice I creating one of those graphs in Microsoft Excel to help me understand the Fairford timetable, put all the station and timing into Excel and using the right buttons it produced the graph. Page created in 0.336 seconds with 42 queries.